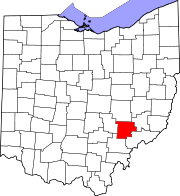 Morgan County is a county located in the U.S. state of Ohio. As of the 2010 census, the population was 15,054, making it the fourth-least populous county in Ohio. Its county seat is McConnelsville. The county was created in 1817 and later organized in 1819. It is named for Daniel Morgan, an officer in the American Revolutionary War. Morgan County was formed on December 29, 1817, from portions of Guernsey, Muskingum and Washington counties. It was named after Daniel Morgan, a member in the Congress from Virginia, and general in the American Revolutionary War. According to the U.S. Census Bureau, the county has a total area of 422 square miles (1,090 km2), of which 416 square miles (1,080 km2) is land and 5.4 square miles (14 km2) (1.3%) is water. As of the census of 2000, there were 14,897 people, 5,890 households, and 4,176 families residing in the county. The population density was 36 people per square mile (14/km²). There were 7,771 housing units at an average density of 19 per square mile (7/km²). The racial makeup of the county was 93.66% White, 3.41% Black or African American, 0.35% Native American, 0.08% Asian, 0.26% from other races, and 2.24% from two or more races. 0.41% of the population were Hispanic or Latino of any race. There were 5,890 households out of which 30.90% had children under the age of 18 living with them, 56.90% were married couples living together, 9.90% had a female householder with no husband present, and 29.10% were non-families. 25.50% of all households were made up of individuals and 12.00% had someone living alone who was 65 years of age or older. The average household size was 2.50 and the average family size was 2.98. In the county, the population was spread out with 25.30% under the age of 18, 7.80% from 18 to 24, 26.30% from 25 to 44, 25.00% from 45 to 64, and 15.60% who were 65 years of age or older. The median age was 39 years. For every 100 females there were 96.50 males. For every 100 females age 18 and over, there were 94.90 males. The median income for a household in the county was $28,868, and the median income for a family was $34,973. Males had a median income of $30,411 versus $21,039 for females. The per capita income for the county was $13,967. About 15.70% of families and 18.40% of the population were below the poverty line, including 25.10% of those under age 18 and 12.40% of those age 65 or over. As of the 2010 United States Census, there were 15,054 people, 6,034 households, and 4,140 families residing in the county. The population density was 36.2 inhabitants per square mile (14.0/km2). There were 7,892 housing units at an average density of 19.0 per square mile (7.3/km2). The racial makeup of the county was 93.2% white, 2.9% black or African American, 0.3% American Indian, 0.1% Asian, 0.2% from other races, and 3.3% from two or more races. Those of Hispanic or Latino origin made up 0.6% of the population. In terms of ancestry, 21.2% were German, 12.9% were English, 12.7% were Irish, and 9.8% were American. Of the 6,034 households, 29.7% had children under the age of 18 living with them, 53.4% were married couples living together, 10.4% had a female householder with no husband present, 31.4% were non-families, and 26.3% of all households were made up of individuals. The average household size was 2.46 and the average family size was 2.94. The median age was 42.4 years. The median income for a household in the county was $34,962 and the median income for a family was $40,440. Males had a median income of $37,173 versus $30,176 for females. The per capita income for the county was $18,777. About 15.7% of families and 19.1% of the population were below the poverty line, including 25.2% of those under age 18 and 12.6% of those age 65 or over. This page was last edited on 17 September 2018, at 20:09 (UTC).